Every year, around the time of the iPhone's release, reports of problems plaguing Apple's new smartphone inevitably pop up. 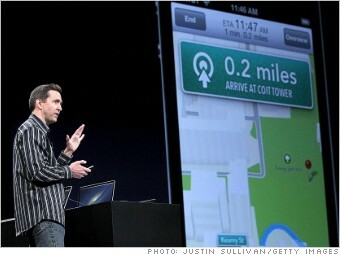 Apple's Scott Forstall previewed the new Maps app at an Apple event in June. After using Google's mapping data for five years, Apple (AAPL) went in a new direction with its iOS 6 update to its mobile operating system, which rolled out Wednesday to almost all iPhones. The tech giant partnered with TomTom, Waze, Yelp (YELP) and others to create its own map, complete with turn-by-turn navigation and a cool new 3D "Flyover" feature. Most users seem to agree that the new Maps app looks beautiful -- but looks can be deceiving. Behind the new facade is significantly less data powering the app. Google's enormous base of data points have been replaced with Yelp's far less substantial list, as well as Apple's own compiled "places of interest" database. In other words, good luck searching for your favorite off-the-beaten-path restaurant if it's not on Yelp. Slight spelling variations also seem to trip up the new Maps app. Beyond search, iPhone users have already found some giant goofs in Apple's data. The info on some well-known landmarks is comically off target or woefully incomplete.